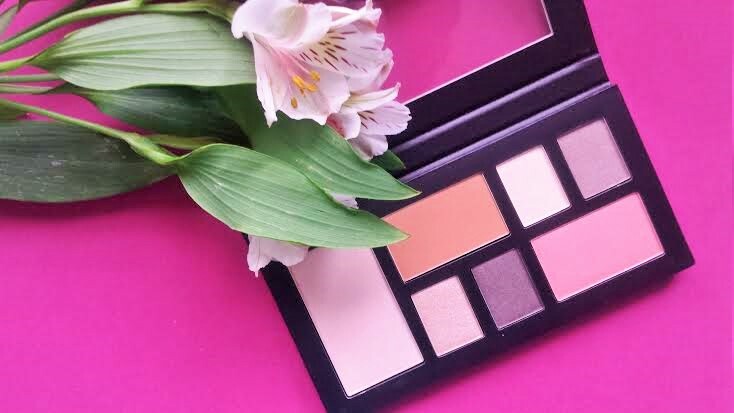 I think it’s fair to say that us beauty bloggers love a good palette, so of course I was really happy to get my hands on this one from Collection! It contains all the essentials in one place with a highlighter, blusher, bronzer and four eyeshadows. The bronzer is a lovely warm shade that could double as a blusher depending on your skin tone. I don’t tend to use it all over my face but on the apples of my cheeks and up to the temples with a little swish across the hairline and the jaw line. The blusher is a delicate pink that gives just a hint of flush, it’s not shimmery which I like as it compliments the sheen of the highlighter and doesn’t fight with it. The four shimmery eyeshadows can be used together for a complete look or separately for a tone down neutral approach. Collection suggests that you use the highlighter eyeshadow under the brow and at the corner of the eye and then blend the lighter shadow all over the lid. Then, use the medium shadow to add definition to the centre of the lid and finish with the darker shadow in the outer corner, blending it across to the centre of the lid. You could also use the darker shade along the bottom lash line. It’s definitely a set to keep at home as it’s a little bit big to carry around in my make-up bag. But it’s marketed as a pro palette so that’s to be expected. It comes in a sturdy cardboard case but there aren’t any extras such as a mirror or brushes but when I tell you that it retails at just £6.99 I think you’ll agree that they’ve done a great job in including so much for the money! It launches exclusively in Boots from 14 October so look out for it! The is product was gifted to me for review but the opinions are my own and are not prescribed. This post contains affiliate links.